Gardner Webb's yearbook has been made available via the DigitalNC Library and it's a nice collection of yearbooks. This is a great source for G.W. 's football history as much has been glossed over by the university. 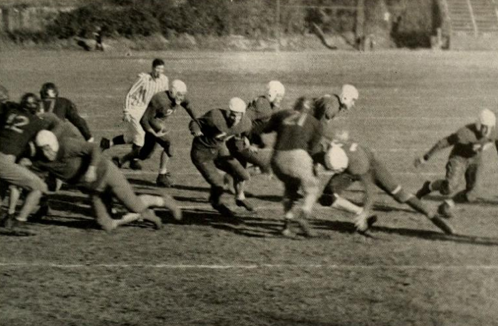 The school considers the beginning of the program 1970 - the year the school went from junior college status to senior college status - but the true advent of Gardner Webb football traces its lineage back to 1928-1929 when then Coach B.G. Rackley and Assistant Physical Education Director Broadus Simmons mandated the creation of both high school and college level teams for the school. Boiling Springs J.C. rolled along until 1942 when the Governor of North Carolina Governor O. Max Gardner put forth efforts to improve the college. Later that summer the school became Gardner-Webb Junior College and by 1971 the school was a full-fledged accredited senior college. So while the university (university accredited 1993) lists 1970 as the starting point for its football team, the roots of the program reach way back.... before the school was touched by Gov. Gardner and perhaps before the school was even a junior college. I believe the true value in these publicly available online yearbooks isn't in chronicling the triumphs of the biggest and best football schools - it's highlighting the origins and upbringing of the sport in some of the smaller schools who may have enjoyed less gridiron success.